In many dry material processing systems, thermal treatment of the bulk product is required. It is often necessary to heat the product during a production process, for example for crystallization, degassing, prevention of condensation, drying of internal or external moisture or preparation for downstream thermal processing sections (such as extrusion). Bulk solids cooling is a common step in many industrial processes. It generally occurs near the end of the processing sequence when powders or bulk solids must be cooled prior to storage or packaging to allow for safe handling and storage. Bulk solids cooling can be necessary if the production temperature is high but the solids are processed downstream at a lower temperature. 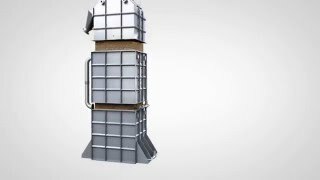 There are different technical solutions for the thermal treatment of bulk solids. Both direct and indirect processes are possible. This Technology Zone offers an insight into the latest innovations in bulk solids cooling and heating technology. After two years of development, Allgaier Process Technology is presenting a new, combined drum dryer/cooler system based on the MOZER® system: the TK-D. This system makes it possible to take previously dried solids and cool them down to especially low temperatures, all the way down to nearly the ambient or cooling air temperature. SEVENUM – Things are changing rapidly in meat production and the animal feed industry. Consumers have an increasing influence on animal welfare and the feed that the animals are consuming. Several feed additives that were used to control undesired pathogens have already been banned in order to avoid negative effects and to produce a natural and healthy piece of meat. Since 1990 MIX has been projecting and manufacturing in Cavezzo (Modena) mixing systems and industrial components for bulk solids handling. In the age of leading-edge technology and dataflow, size and speed are the criteria on which innovation is measured and interest is cultivated. The latest spray dry nozzle release from Spray Nozzle Engineering called ‘Click&Dry’ introduces new innovation in 40 years since high-pressure spray drying nozzles began. Assessing HAZOP and Hygiene Design Requirements in Reducing Chemicals and Increasing Assembly Safety. With our new Vacuum Dryer/Coater, you can vacuum dry products and coat them using just one machine. Applications include: rapid and effective drying of pharmaceutical components (such as APIs), impregnation and drying of catalysts, liquid and gas reactions with powders, soaking special plastic compounds, etc.